IRON MOUNTAIN — Delphia J. Stone, 66, of Vulcan, passed away Monday, July 16, 2018, at Pinecrest Medical Care Facility in Powers. She was born on March 20, 1952, in Henlawson, W.Va., daughter of the late Jessie and Eula Maynard. 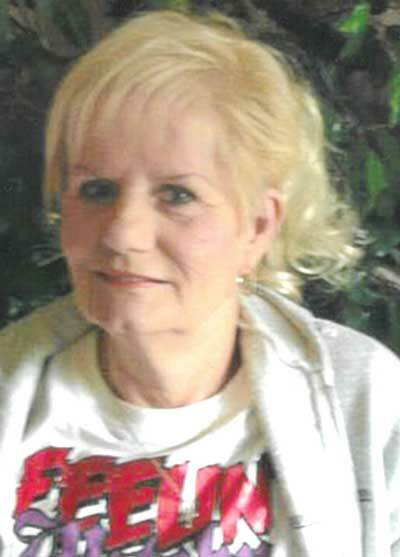 Delphia resided in the area for the past 35 years and worked as a home healthcare aide for many of those years. She married Larry Stone in October 1991, in Norway. Delphia enjoyed rose bushes and loved working on her computer. Survivors include her loving husband, Larry; one daughter, Angela “Missy” Conley, Vulcan; six sisters, Fran (Benny) Vance, South Beloit, Ill., Sharon (Gary) McKinney, Logan, W.Va., Adria (Ricky) Hale, Logan, Tammy (Roger) Watts, Logan, Kim Maynard, Iron Mountain and Kelly Maynard, Jacksonville, Fla.; many grandchildren, nieces and nephews. In addition to her parents, Delphia was preceded in death by one daughter, Delaina Sue Conley; four brothers, Oley Maynard, Robey Maynard, Patrick Maynard and Timothy Maynard; and three sisters, Ann Leslie, Patricia Porter and Shelly Alexander. Visitation will be 10 to 11 a.m. Friday, July 20 at the Jacobs Funeral Home, Iron Mountain. A celebration of Delphia’s life will be offered by her brother-in-law, Ben Vance. You may light a candle in remembrance of Delphia or leave a condolence for her family online at www.jacobsfuneralhomes.com. The family has chosen the Jacobs Funeral Home, Iron Mountain, to honor Delphia’s legacy of life.